In past years, ATZ has posted Bruce Handy’s first snow of the season photos in December and January and once in October during the weather event known as Snowtober. On Sunday night, the Coney Island photographer went for his first snow of the season stroll on the Boardwalk and Pier. We selected images of the amusement parks and rides enveloped in the quietness of a snowfall. It couldn’t be more of a contrast to the boisterous days of summer. You can see the complete set in the photographer’s Coney Island Photo Diary. Coney Island had a Mardi Gras celebration every September until 1954, but ATZ had no idea that Popeye the Sailor Man and his rival Bluto were once part of it! Many thanks to sideshow historian James Taylor, publisher of Shocked & Amazed! On and Off the Midway, for sharing this fun find. In this 1935 cartoon, Popeye and Bluto perform duelling sideshow acts against the backdrop of Coney’s rides and amusements. “Oh, I’m King of the Mardi Gras, in fact I’m the whole bloomin’ show,” sings Bluto as he struts onstage in front of his awesome banner line. I run the whole works here at Coney, What power supreme I enjoy! I’m one of those things. In fact I’m the real McCoy! A few steps away, Popeye blusters on a makeshift stage and steals Bluto’s audience by resorting to dirty tricks. “So the message is that, if you screw with a guy’s act, you’re the hero of this thing? Jeez,” writes Taylor on the Shocked & Amazed! Facebook page. “Still, how often you get to see Popeye AND sideshow together?” The sideshow acts and roller coaster climax are well worth the price of a ticket. Over the weekend, the supports for Zamperla’s Flying Coaster (aka Volare) arrived in Coney Island and were unloaded on the lot behind Beer Island. The supports were the first pieces of equipment to arrive at the future Scream Zone, which will be built on City-owned parcels on Stillwell Avenue. As ATZ reported last month, the Flying Coaster from Denver’s Elitch Gardens was bought back by Zamperla with the intention of refurbishing it and installing it in Coney Island in 2011. The Flying Coaster along with a Steeplechase-themed Moto Coaster, Sling Shot and Turbo Force will be set up on the east side of Stillwell behind the Boardwalk buildings occupied by Nathan’s, Cha Cha’s and Ruby’s. 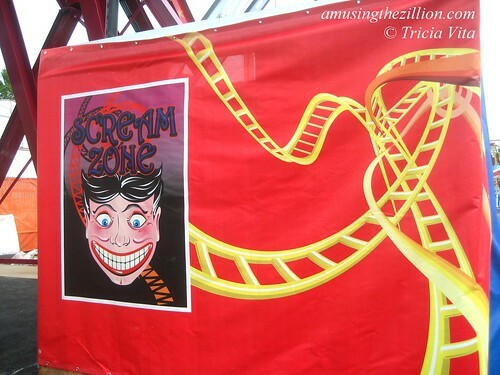 The entrance to Scream Zone is expected to be where Shoot the Freak is now. In September, ATZ attended a panel discussion in which Zamperla USA’s CEO Valerio Ferrari unveiled a rendering of the flying coaster “American Eagle” aka the Volare in a presentation about new rides slated for Coney Island’s Scream Zone. On Zamperla’s website, the coaster is called Volare, which means “to fly” in Italian. You can watch a YouTube video of the coaster in action here. The Elitch Gardens Flying Coaster was a prototype that made its debut in May 2002 and has been SBNO (standing but not operating) since 2008. The Coney Island Rumor Mill had been speculating for months that the Elitch Gardens coaster would come to Coney. Zamperla flying coasters can also be found at Rye Playland (“Super Flight”), Canada’s Wonderland (“Time Warp”), Vienna’s Wiener Prater, Genting Theme Park in Malaysia and Kaeson Youth Park in North Korea, among others. February 15, 2010: Steeplechase Express: Will Zamperla MotoCoaster Pony Up for Coney Island? On Thursday, September 30, CUNY Graduate Center and Save Coney Island are co-hosting “Heritage, Rides, Redevelopment: What’s Next for Coney Island?,” a discussion moderated by Pulitzer prize winning historian Mike Wallace. This is one panel discussion we’re actually looking forward to because the panelists are not academic talk, no-action kind of guys. They’re in it to win it, as we say on the midway. Speakers include Valerio Ferrari, president and CEO of Zamperla USA and Central Amusement International (CAI), operator of Coney Island’s fabulously successful new Luna Park; David Malmuth, former Disney vice-president, developer of Times Square’s New Amsterdam Theatre, and chief presenter of the Municipal Art Society’s “Imagine Coney”; and Michael Immerso, historian and author of “Coney Island: the People’s Playground” and a recent opinion piece in the Wall Street Journal on the benefits of preserving Surf Avenue’s historic buildings. We’re eager to hear what Valerio Ferrari has to say about his company’s plans for next season and beyond. Zamperla/CAI has a ten-year lease to operate amusements on the 6.9 acres the City bought for $95.6 million from Thor Equities. As we pointed out in our article for IAAPA Funworld, the new Luna Park is a partnership with the City of New York, which receives $100,000 annual rent plus an undisclosed percentage of the gross. This arrangement represents a successful new model for government-owned amusement parks, which are a rarity. Yesterday, the Mayor’s Office released figures that more than 400,000 visitors took 1.7 million rides during Luna Park’s inaugural season, prompting the City and the park to extend the season through Halloween. We’re thrilled that Scream Zone, set to open next spring at the Boardwalk and Stillwell, will bring in more new rides, including two Zamperla coasters and a SlingShot as well as Go Karts, which have been missed in Coney since Thor evicted them. It will be interesting to see where David Malmuth takes up the discussion. His plan for Coney Island’s amusement area at MAS’s Imagine Coney event in 2008 was a huge hit with fellow amusement advocates. Though we lost the battle with the City to expand the acreage rezoned for outdoor amusements, Malmuth is still the guy who dazzled us with statistics: “Park sizing analysis suggests that Coney Island will require a minimum of 25 acres to support 3.4 million visitors, ” he said. “It can’t be done in 9 acres. No possible way you can create the variety, and the diversity and joy and excitement with only 9 acres. Minimally you need 25 acres to support that level of attendance.” Malmuth’s stats and charts of park attendance can be found in this pdf available on MAS’s website. “What’s Next for Coney Island?” is sponsored by the Environmental Psychology Program at the Graduate Center of the City University of New York, the NYC Graduate Urban Research Network, the New York Landmarks Conservancy, Save Coney Island, the Historic Districts Council, Coney Island USA and the Coney Island History Project. Thursday, September 30, 6:30 – 8:30 pm, free event, online registration. The title of Coney Island photographer Bruce Handy/pablo 57‘s knockout photo of this popular kiddie ride at Deno’s Wonder Wheel Park is “Whale Vibrations.” Commenters on his flickr photostream liked the composition and the splash of color against a clear blue sky. It’s one of our favorites, too! The ride’s official name is Willie the Whale and its manufacturer is Zamperla, whose Luna Park with 19 rides is set to open next door to Deno’s on Memorial Day Weekend. Willie the Whale is one of three Zamperla rides currently operating in Coney Island’s amusement area. Can anyone guess the names and locations of the other two? We’ll post photos of those rides as soon as we receive the correct answers. Coney Island’s 40 rides including the Wonder Wheel and the Cyclone roller coaster opened for the 2010 season on Palm Sunday. This weekend is sunny with temps in the mid-70s. Willie the Whale says come out and ride! 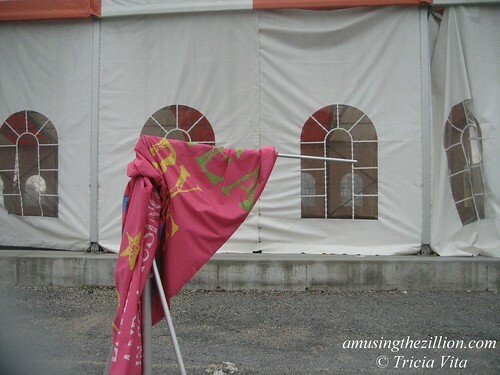 April 30, 2010: Can You Identify This Mystery Object at Coney Island’s Luna Park? March 29, 2010: Photo of the Day: First Ride of the Season on Coney Island’s Cyclone! 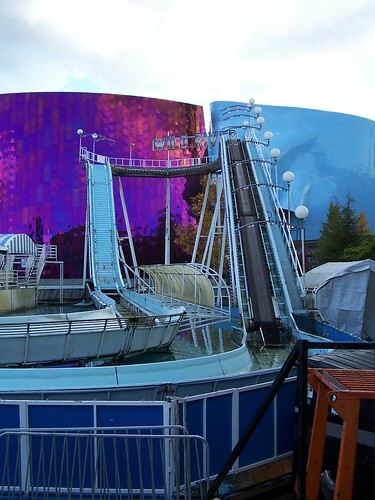 Do you miss Neptune’s Water Flume, which was dismantled when Astroland closed in 2008? The log flume was one of our faves too and we treasure the fading souvenir photo from our last ride. The good news is a Reverchon flume will be among the 19 rides at Coney Island’s new Luna Park this summer. The ride was purchased from Seattle’s Fun Forest Park and will be the only used ride in the park according to a poster on the ultimaterollercoaster forum. The photos above and below show the flume in Fun Forest Park with the Experience Music Project building in the background. Fun Forest was created at the base of Seattle’s Space Needle after the 1962 World’s Fair, but the park’s operators lost their lease on the city-owned property and will close after Labor Day 2010. The park’s biggest rides have already been dismantled and sold. 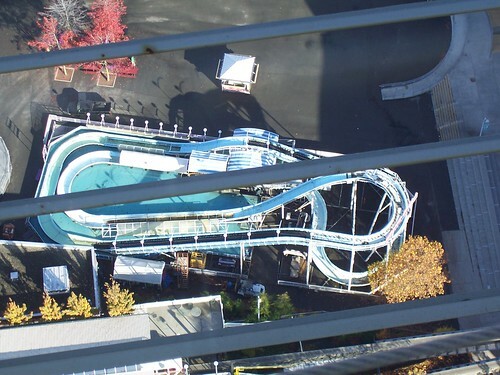 Roller Coasters of the Pacific Northwest reports that the Windstorm roller coaster was sold to Steve Vandervorste (an independent ride operator based in Texas); the log flume to Zamperla; the Orbiter, Jet Spin and Himalaya to Butler Amusements; the Galleon to Oscar’s Amusements of Pennsylvania; and the Century Wheel to Helm and Sons of California. 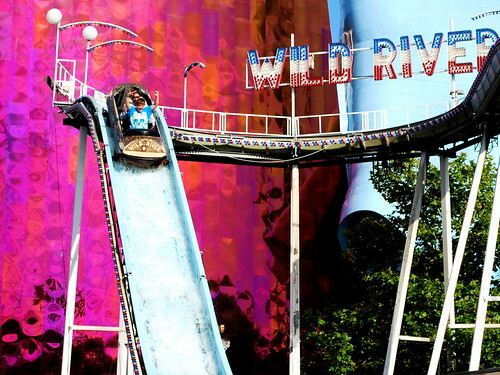 We’re thrilled that Fun Forest’s Wild River has found a new home in Coney Island. Seattleites visiting New York City this summer are especially welcome to come to the new Luna Park and cool off on their flume! 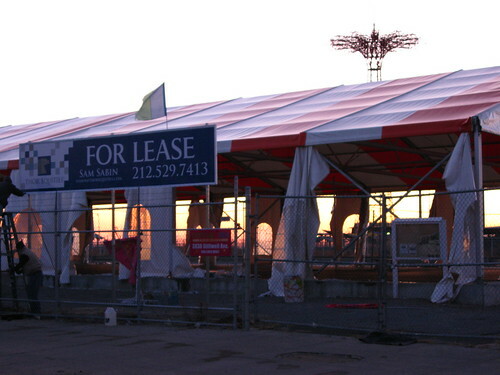 Thor’s Coney Island: Wanna Lease Stillwell? That’ll Be $500K Up Front! 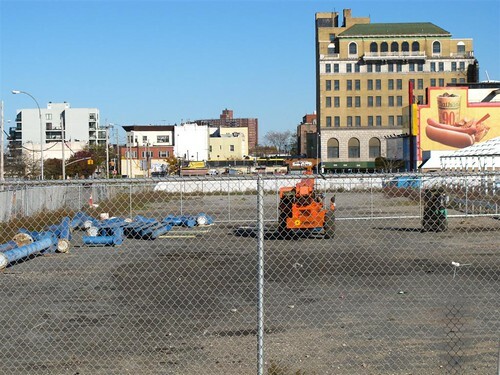 One month ago, ATZ asked “What is Joe Sitt planning for Stillwell Avenue in Coney Island 2010?” Still no word on Stillwell from Thor Equities, though Coney Island’s 40-plus rides and diverse attractions will open in just 20 days. Palm Sunday– March 28th this year— is the traditional season opener in Coney Island. The Cyclone roller coaster, Deno’s Wonder Wheel Park, McCullough’s Kiddie Park and the Eldorado Bumper Cars are busy getting ready for the big day. In fact, the Eldorado as well as Paul’s Daughter, the Grill House and Gyro Corner on the Boardwalk were already open last weekend! Yet Thor Equities property on Stillwell, the gateway to Coney Island’s beach and Boardwalk, still looks like the ghost town of last summer’s failed flea market. Here’s why: The Coney Island Rumor Mill says that Sitt is asking $500,000 for both sides of Stillwell and he wants all of the money up front! According to sources, Sitt is not willing to negotiate on the amount either. This lack of flexibility doesn’t surprise us. Half a million is actually a 75 per cent reduction from Sitt’s original asking price! As ATZ reported last month, sources said several carnival and amusement park operators balked at Thor’s initial asking price, a cool $2 million for the two 50,000 square foot parcels. Some of the interested parties were contenders in the City’s RFP for a Coney Island Amusement Operator, which was won by Zamperla. The Coney hopefuls who put in bids for Thor’s parcels were said to be balking at the slew of onerous lease terms such as a 30-day-vacate clause. 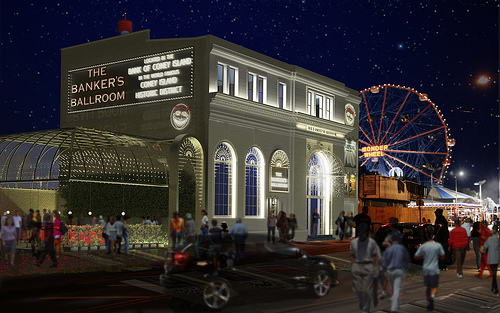 (“Coney Island: Amusement Operators Balk, Money Talks at Stillwell,” Feb. 10, 2010). Negotiations continue for carnival rides and a go kart track though rumor has it that one of the potential amusement operators told Sitt’s agent where to take his lease and shove it. Good negotiating strategy or goodbye Coney Island? When all is said and the deal is done, we may see Geren Rides back on Thor’s property for the third year in a row. The Georgia-based carnival operator did after all buy a Schwarzkopf Wildcat roller coaster, Reverchon Himalaya and other rides last year with the intention of coming back to Coney.